The Ferrari 250 Breadvan from Tour Auto 2014, just a snippet of the great work by Singhof, traveling to car events all over the world. As a fellow photographer ran past me a few years back, I thought to myself, “I think I know him.” I knew I had seen that ponytail before. A few months later and an ocean away, yet again the ponytail guy races past me, loaded with camera in hand. Ron: Peter, who do you work for? Peter: Yes, I am freelance, but Anamera is my primary income. 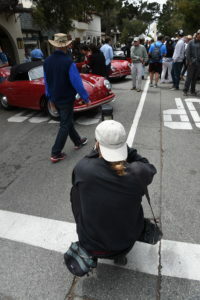 With the ponytail tucked behind the hat, surely you’ll recognize this photographer at the next auto enthusiast event. Ron: I see you at every event. Unbelievable, but you seem to be at all of them. So, how did this all begin? Peter: It began as a hobby. I was restoring cars with my parents, so I was looking at cars all of the time. I bought my first camera, shot some pictures, which by today’s standards are horrible, but eventually I became published, and so I got more and more into it. Now I do it full-time. Ron: I see you in Europe quite often, certainly at Le Mans. Peter: I’m in Europe about every 2nd weekend with an event; sometimes the events are on the same dates. Ron: That’s amazing! Most people dream of going to one of these events a year; you go to every event. Peter: It also has a downside. You get used to going. That first-time enjoyment that you used to receive from an event such as Goodwood Revival, you’re just blown away by the atmosphere. It’s not only about the cars, but it’s about the people dressed up. Well, that captivation disappears after the 10th time because it looks the same every year. For you, it’s still special, but the magic is gone a bit. So, that’s why I always look forward to new events. Did you enjoy meeting the photographer enthusiast? You can read more about Peter’s work and his various travels in Via Corsa Magazine’s issue 7.